Brody Beason beats two defenders after making the catch to score North-West Nodaway’s opening touchdown against East Atchison August 25 at Tarkio. The Wolves would go on to defeat the Muskets 66-20 to end the game early in the fourth quarter. 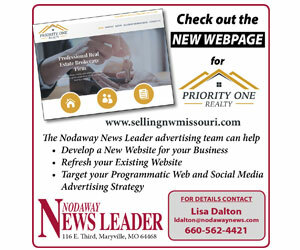 For more information and photos, see the printed Nodaway News Leader.